From time to time, these three letters have been the initials of words that represented certain notions, to which I was draw to in a weird way, for example, diversity, respect, transcendence, to know thyself all off which resulted into a humorous quote which is known amongst my closest friends and family. This constitutes my established nickname since 1998 and most people don’t even know my given name. Growing up in Nafplio, I liked the fact that kids my age were making fun of my not so pleasantly sounding nickname, but when they would see the artistic creation that this represented their teasing would stop. I am, also, charmed by people that are usually underestimated at first, but who constitute unique and well-structured personalities. When and how did you start doing graffiti? Do you remember your first piece? Strangely, I started doing graffiti in a city that didn’t have the characteristics of the stiff cityscape. However, drawing inspiration from the Greek hip hop groups, loving doodling and exploring, with a sense of naïve rebelliousness and of course the need of differentiating my personality from the football lovers my age, I drew my first complete piece in third grade of junior high. Hiding it from my parents, joined by friend that were just enjoying the rush of adrenaline, I did it between the hours of 15.00 and 17.00, which means in the hours when the inhabitants of the provincial towns are asleep. Having unacceptable spray using skills and zero sense of scale, the drawing was gigantic and impossible to finish! Using Cosmos colors, a style influenced by a graffiti of TXC designed by Dez and Beef (which I had seen in a book called “Graffiti in Greece”), followed by a copied skull and a hand that was pointing and a bubble with the aggressive cue “My old style to your face”. Unfortunately I never photographed it, but I have the draft in my archive. Judging by your work in the streets, there is a main character. Does he have a name? Is there continuality amongst the designs in the different parts of the city where you draw? Is there a story? He is anonymous, as everyone in the large city, but anyone would wish to give him his own name. Any appearance of his is independent and constitutes one more piece of his history. Why is he in black and white? Even though he is very detailed, it is like he has no mouth! By using the “Imaginary Rooms” we use plenty of color, as we interact with the kids. Colorful wall paintings, Illustrations etc. By bringing balance in my life, this black and white world was also created which represents a cruel side of the reality in which we live with the time pressure, little room for experimental expression and plenty of anxiety. The duotone of this particular character is saving me valuable time. At the same time I enjoy the solid color and especially the clean surfaces which have ceased to exist on the overloaded Athenian walls. He is also black and white, as me, without the middle tones. It is true, he has no mouth. Since I am a very talkative, descriptive and narrative person, this particular person is exactly the opposite. He is silent. My goal, however, is for his silence to become deafening at some point. 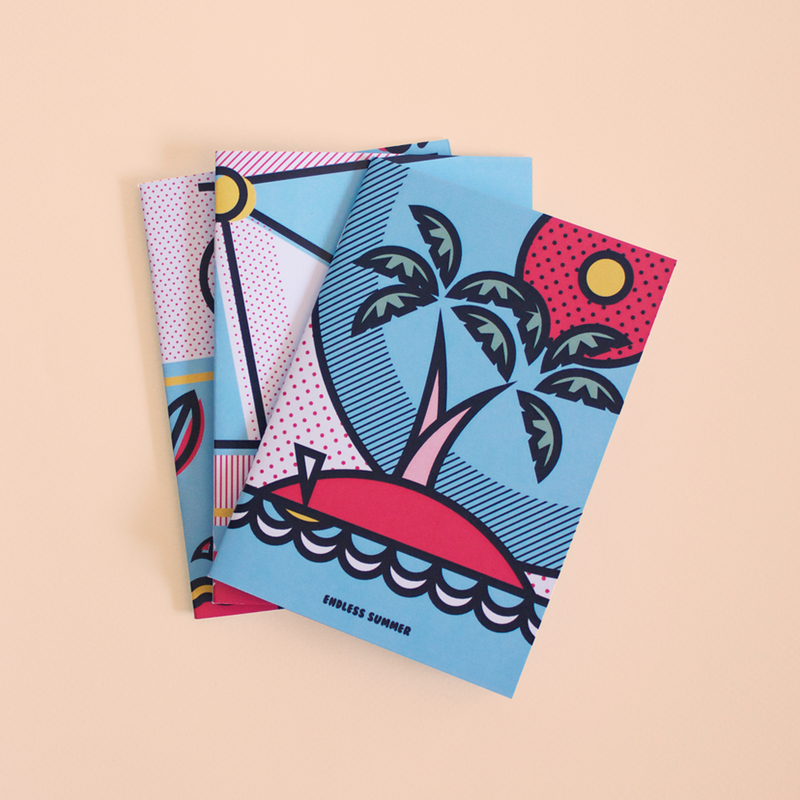 You truly occupy yourself many projects associated with illustration. Where do you find the time? Do you prefer a certain application? I like everything equally. Now, I prefer anything that fills my “batteries”, which are the drawing workshops with children and teenagers. I find the time, having minimized the distance between home- office. Also, I am supported and helped by my colleague- wife- partner in crime Nadia Stasinou. Co-founder of “imaginary rooms”. What are you do, when and how did it begin? Basically, we are doing what we always did. We draw, interact with people, we inspire and get inspired. It officially began in 2011. We always wanted to arrange our affairs as adults and anticipate our work. That is why we teach spontaneous drawing and photoshop to kids, graffiti to teenagers, freehand and line drawing for the final exams to students in high school, illustrations, graphic design and mural to individuals or companies. Doodle workshops for really young kids!!! Is it true that the youngest a person, the more interesting his drawing? In reality many of the artists maintain very vividly their juvenile nature. Can anyone draw? Everyone can draw, school simply forgot to teach us. Artists in general are not afraid to make mistakes, to share their feeling and thoughts. This is something that kids do instinctively but we usually scold them for it. This spontaneity and experimentation is definitely interesting, firstly to the creator himself and then to the spectator of the process or the product of such an experimentation. Compared to a three year old kid who creates a beautiful smudge, I am more surprised by a fifty year old who is shocked when he draws a smudge consciously after decades and brings out the kid within him. Collaborations with other graffiti artists which you distinguish? Is there a Greek artist whose work you really admire? I haven’t collaborated with many graffiti artists in order to distinguish some, but I have special emotional bonds with old graffiti partners, Wake, Link and the guys from my crew Yakuza and 2A. I admire thousands of artists. I distinguish Stamatis Laskos (Sive) and the diametrically opposite Blaqk. The urban culture is directly linked to graffiti. The center of Athens seems like it has too much spray. Shall there be restrictions and subcontracting of specific spots or is that the whole essence of street art? Street art has no essence or rules, every creator or spectator can draw his own conclusions and it has a unique philosophy. Personally I am irritated when it appears on street signs (however that is usually done by football fanatics- vandals, so I propose the abolishment of football as a profession linked to the current financial system) and the windows of trains. Where did you grow up? Do you live in the center or the suburbs of the city? I grew up in Nafplio, I spent my summers in Kos and Oreini Korinthia and I studied in Volos. It was by pure chance that I found myself living in the borders of Cholargo and Papagos, which it something that I really enjoy. I feel like living in the countryside, having direct access to any part of Attica’s basin. 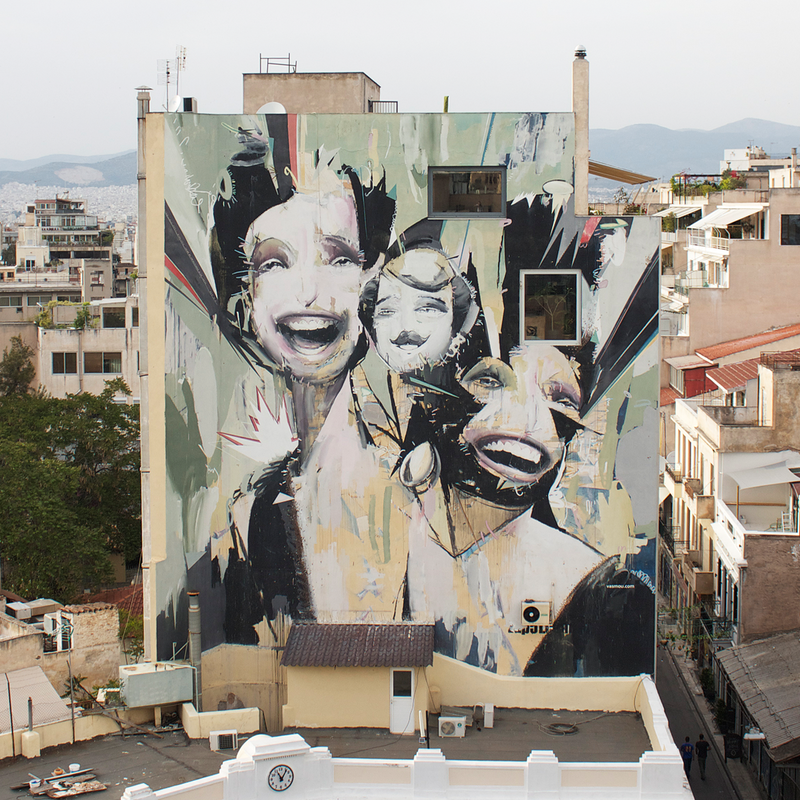 Entry in the exhibition of Onassis Cultural Centre amongst other Greek street artist. Tell us a few things about this. 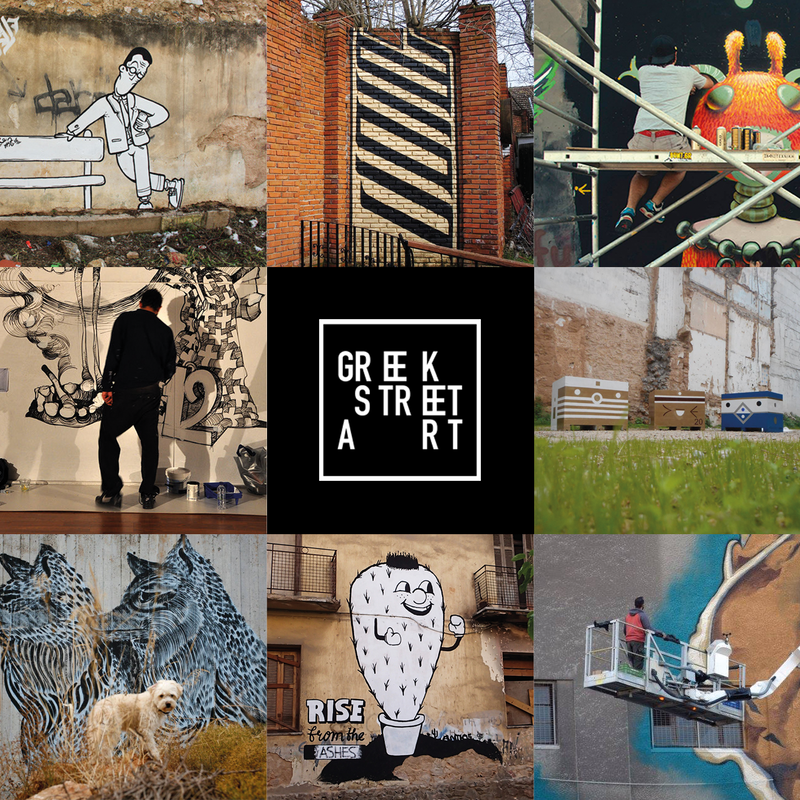 It was the most adequate graffiti exhibition that had taken place in Greece and Marilena Karra, who was the supervisor, deserves many praises. I am very glad that I was a part of it and that we also introduced, through a workshop, kids from ages 7 to 11 to this particular culture. In ten years from today? Posted in interview, Street Art and tagged athens, creative, graffiti, greece, greek street art, illustration, mural, people, rtmone, urban culture. Bookmark the permalink.